The “Ash House” at the prompting of our partner, Larry Andress, who managed the project. 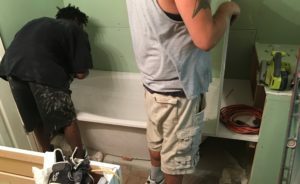 This was the first project where we partnered with another company, in this case Andress & Three, LLC, which is owned and operated by Larry, a new friend we met at a conference in Houston, and his partners. We closed on the sale of this house at the end of October, 2016. The title company slowed it down, because apparently it’s hard to find appraisers right now. 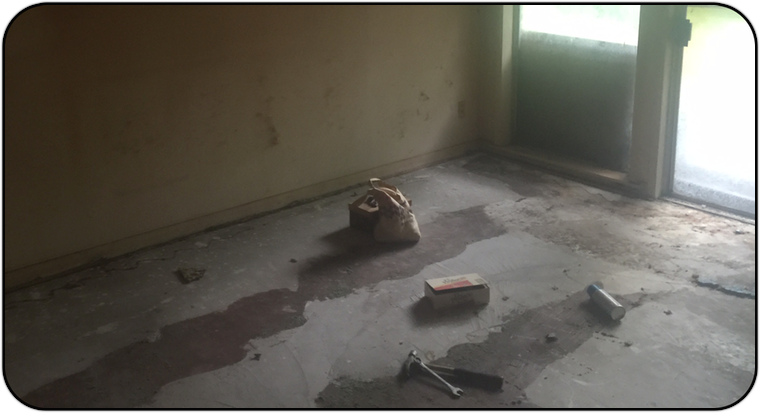 A lovely young couple bought the house, and they plan to convert the garage area and add an addition back there to create apartments for their parents. What a great use of the large back yard. And putting a building on top of all that bamboo should at least stunt its growth! Cleaning out the overgrown vegetation, painting with appropriate colors, and installing a new roof did wonders to reunite this grand old lady with her dignity. On first sight, the house was out of keeping with the well-kept neighborhood on which it resides. Exterior maintenance had obviously been neglected for years. The entire property had become a miniature jungle only blocks from a country club. We put on a new roof. Then we repaired all of the facia and power washed the brick. The colors we chose were out of the Frank Lloyd Wright playbook because we thought the architect who designed the house was influenced by the icon. 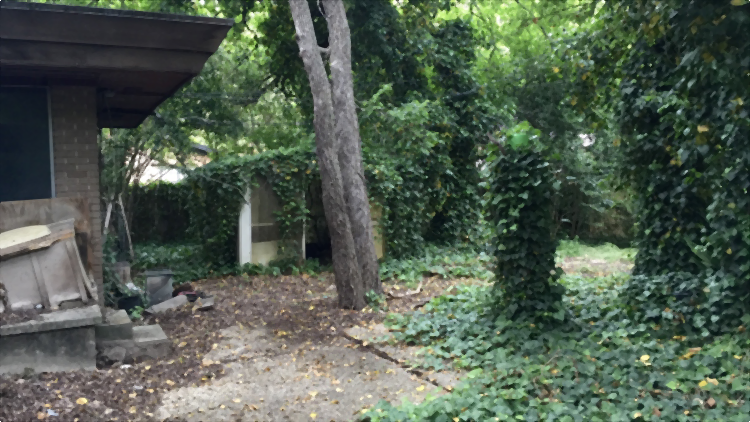 Mowing the yard and cleaning up some of the overgrowth went a long way to helping the house look more inviting. By the time we were a third of the way into the project, many of the neighbors were stopping by to tell us or our contractors thank you. 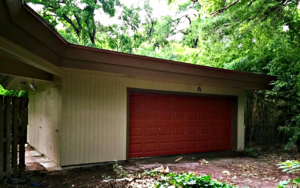 Paint, a new garage door, and treating weeding as an extreme sport also made the garage appealing and usable. The two-car garage attaches to the house via a small breezeway. The garage was almost completely obscured by bamboo and a huge Lady Banks rose that had climbed over the roof. I would have loved to leave it there because the delicate yellow blooms were the prettiest part of the yard. But we had to prune it back severely to replace the roof. 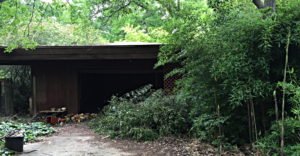 The rose also hid three storage units built onto the side of the garage. These are a unique feature and part of the character of the house. We cleaned them up a bit and kept them. Inside the garage, someone had partially walled off one of the stalls to make a dark, scary room. 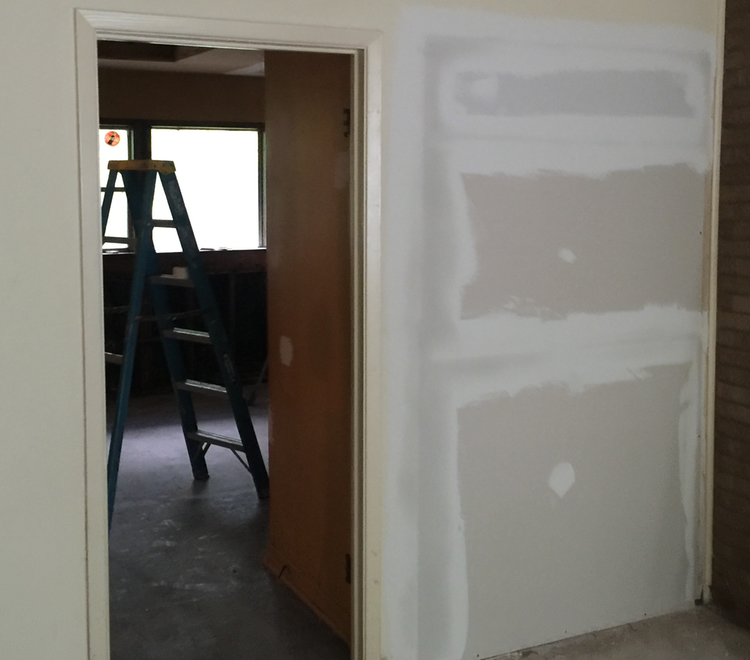 We pulled these walls down to restore the two-car functionality of the garage. That also required removing a trellis that had been nailed over the right side of the door. In cleaning up the bamboo, we found a separate outdoor parking space. Our contractor suggested parking an RV or boat in the space as outdoor staging. We’ll see how that goes. We painted the garage door the same orange-ish color as all of the exterior doors. We are still working on the back yard. It will take a while. 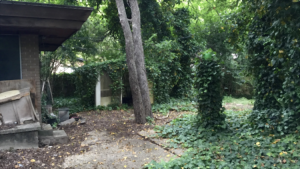 If anything, the backyard was even more overgrown than the front. Even though (or maybe because) Sue Ann and Lee own a property nicknamed “The Rattlesnake Annex,” we were afraid to venture too far into the growth. Many of the trees were covered in ivy. Wild undergrowth obscured the view of the neighbors behind the house, and bamboo crept ever closer to the house. Even the giant Lady Banks rose that had grown over the garage was slowly eating up the available living space in the back yard. 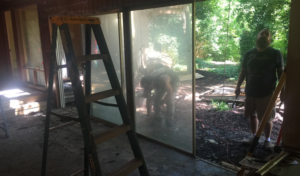 We replaced two sliding glass doors with one French door and two large windows. The original rear entrance to the house comprised three sliding glass doors: two in the family room and one in the master bedroom. 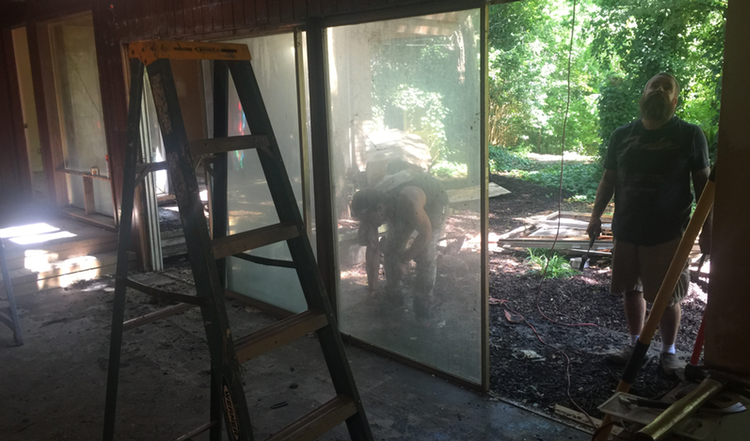 Since sliding glass doors are not fashionable today, we replaced them with French doors. In the family room, we centered the French doors on the wall that originally had two sliders and put huge windows on either side. All that glass did provide great views of the back yard. At least, they were great when the back yard was maintained, and they will be again. Even in its current state of distress, you could tell this house had once been a grand lady. The entrance way runs from the front door to the back wall. It is constructed of brick on both the floor and the wall. We hope to keep this feature because of what it says about the house’s original character. The brick walk way divides the house left to right, as well as vertically. The bedrooms and bathrooms are to the left of the entrance on the same level as the walkway. To the right, you step down into the living/dining rooms or the family room and kitchen. We found an interesting assortment of junk in the living room floor. It’s now light and lovely with the all-new windows, fresh paint, and dark floors. The dining room was more of a suggestion created by a dropped ceiling and unnecessary poles. The dining room had its own collection of fun stuff, including evidence of water leaking through the original full-length windows. There is a reason these wonderful architectural windows are no longer in code. You need more than calc along the bottom to keep water out of your house. Rest assured, we are keeping the character of the windows but replacing them with smaller, compliant ones. The originals did provide a great view of every insect living in the front hedge. We also removed the drop-down ceiling and poles that had defined the dining area. The result is a much more open and usable space. We gladly sacrificed a cheesy dining room built-in to enlarge the pantry to a usable size. Another feature that did nothing to complement the dining room was a built-in china cabinet and sideboard. We don’t think it was original to the house because its quality would have made a trailer house look shabby. We gladly sacrificed it to make the pantry in the kitchen more usable. We fully gutted and rebuilt the kitchen. The white cabinets pop against gray walls, and the all-new appliances make the room seem larger. 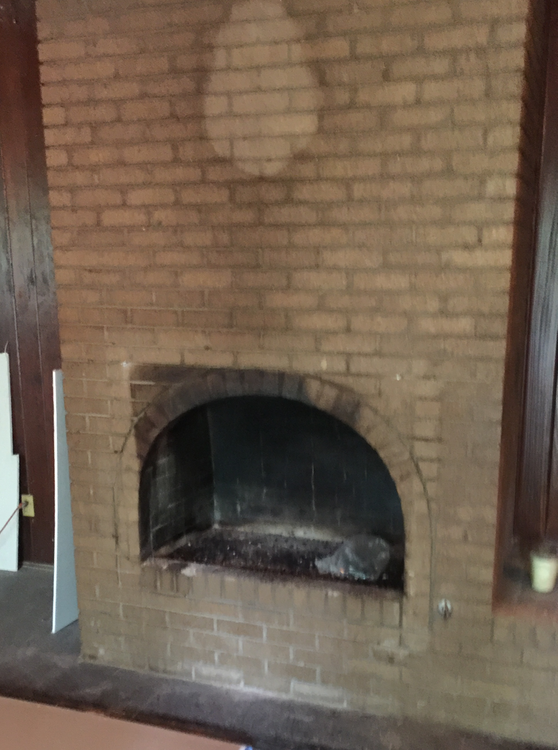 The arched brick fireplace is one of the reasons we bought this house in the first place. We could see past the nicotine and soot stains that had accumulated over the years. 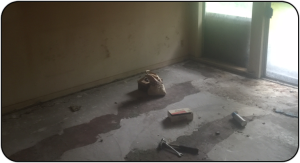 The family room gave us one more bit of character worth preserving. The center (load-bearing) wall that runs the length of the room is adorned with an arched fireplace. The brick was stained with so much tobacco smoke that three power washings with TSP made very little difference in its appearance. You could still see where the deer head had hung for so many years. To the right of the fireplace is an area that could serve for a built-in media center. To its left is a much larger area for bookcases or other furniture. The work we did to the back entrance is described above. We painted an accent wall in the master suite, and fixed up an interesting light fixture that was already there. Big ole bathtub mid-installation. Can’t wait to see the tile behind it! This room will be treasured by its new owners. We put in a custom bathtub, because the space is extra long. Plus there’s a big shelf to sit extra towels, candles, and toiletries on. It’s really nice. Each guest room got new windows, which were sorely needed, new paint and nice new floors. They are a good size for a house this age. Loving the tile choices for the bathrooms. 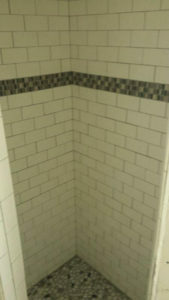 Yum yum, the new tiled shower is a special custom feature you’ll not see anywhere else. This room got a new wall, too.